In remote communities, opportunities for inspiration can be hard to come by. In the isolation, it’s easy for teenagers and young kids to lose hope that there could be anything more for them. 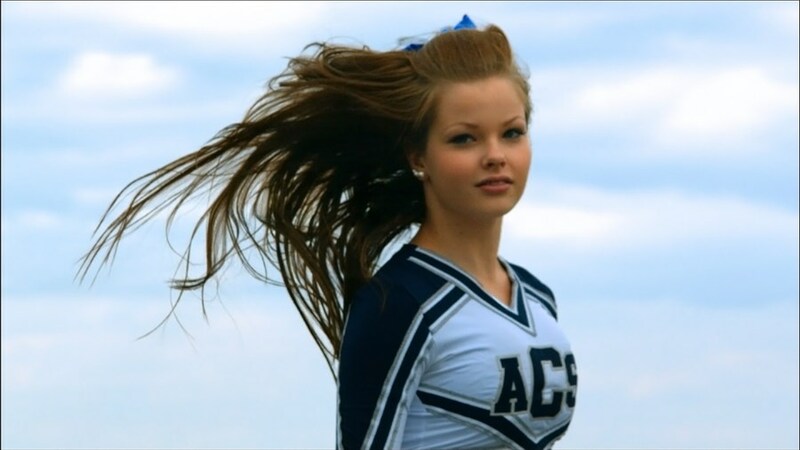 In Finland, above the Arctic Circle, a high school cheerleading coach is aiming to change that by attempting to give the members of her team confidence and a sense that they can achieve something bigger if they work hard and put their mind to it. She is trying to give them a brighter future through sport. However, as Christy Garland’s film Cheer Up shows, how to do you fight the feelings of complacency when you’re the worst team in the country and when the girls let their personal lives interfere? Ambitious coach Miia is tired of losing. Her squad of cheerleaders routinely place last in competitions despite long hours practicing. To fight the feelings of failure, she encourages the team to push themselves to be better and that winning isn’t everything. In an effort to fix the rut the team is in, Miia travels to Dallas, Texas to visit a world-class cheerleading training facility to learn from the best. With renewed energy, she returns home with fresh ideas and attempts to reinvigorate every member of the team. She understands how valuable these experiences for the girls can be in motivating them to see brighter horizons. It gives them opportunities they might not have otherwise had. Despite her best intentions, Miia must also battle against apathy from the girls who have become more interested in boys and asserting their independence than focusing on the dedication it takes to become an elite athlete. Several of the girls are also dealing with personal issues that are pulling focus from their training. In a surprise twist of life, Miia also discovers she is pregnant over the course of the film so now she too must also divert her attention away from the team. Cheer Up follows in the tradition of underdog sports movies that aim to inspire. Over the course of the film, as we get to know the coach and the girls on the team, we move through a great deal of emotional growth and change. It’s an engaging story and we find ourselves rooting for everyone to overcome their challenges and succeed. While at times it is inspirational, it also reminds us that in life not everyone can be a winner. Not everyone achieves their goals and ambitions and we must learn to accept the circumstances when we fail. The film is presented from a strictly observational manner. The director chose to simply allow the lives of these people to play out on camera with as little interference as possible. Often this type of material is accompanied by one-on-one interviews with the subjects to get more personal opinions on the situation and in this case would have perhaps added value to the narrative. We are watching the lives of teenage girls who a lot of the time are closed off and do not speak often. It’s sometimes hard to gauge what the motivations are behind their actions and speaking with them individually would have given more insight. One of the overarching themes of the film is how team sports can become a family and a network of support. As these girls struggle to find their identity, the consistency of having the team to count on provides them with stability. Here they learn the valuable life lessons of friendship, loyalty, dedication, and hard work which in the end are traits that are much more important than winning.